Shanghai Customs, brainchild of Kiwi expat Matthew Waddick, is a great-looking electric Tracker motorcycle now roaming the streets of Shanghai. We covered this in a previous issue. The bike looks really cool, and with the great styling and retro-cool looks, the prototypes on the streets are surely turning heads. Their goal is to garner investment capital to be able to mass-produce these bikes and make them inexpensive. They also claim a range of 200-250km (124 -155 miles), which puts it up in the range of Zero Motorcycles’ offerings. See the video below to check out the bike and the campaign. 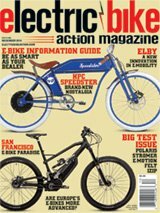 We love the look of these bikes and hope they make it not only into production, but also make it here to the U.S.! For more information, visit sh-customs.com.